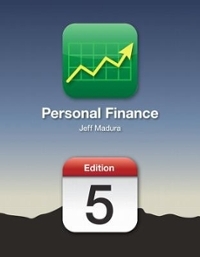 Personal Finance 5 Edition Directed primarily toward undergraduate finance majors, this text also provides practical content to current and aspiring industry professionals, or anyone interested in learning how to manage their personal finances. Personal Finance takes a hands-on approach to building a financial plan. The text’s seven parts each cover one section of a financial plan; Chapter 21 is the capstone. A running example throughout the book and a variety of end-of-chapter cases reinforce the practical aspects of planning.